Dental crowns are protective coverings made to fit over teeth that have been damaged by decay. Crowns can also be used to help strengthen teeth that are weak or have been fractured. Dental crowns come in different sizes and can cover all of the tooth or only part of the tooth. Crowns can also be used to enhance the appearance of damaged or naturally unsightly teeth. Teeth at the back of the mouth that have had root canal treatment. Root canal therapy can leave a tooth in a fragile condition, and a crown can both strengthen the tooth and prevent any further decay occurring within the tooth. A tooth that has an unsightly appearance. A crown can give the tooth a more natural look if the tooth is misshapen or discoloured. This is more of a cosmetic procedure but will give effective results. Teeth that have large amounts of filling. For teeth that have more fillings than actual tooth structure, the process of placing a crown will both strengthen the tooth, and prevent decay entering the tooth if the filling were to break or chip. Grinding of the teeth. Crowns are an option available to patients who constantly grind their teeth and wear down the enamel. Crowns can also be used to hold dental bridges in place and cover dental implants. Your dentist will be able to advise you of the best possible options available, and whether a crown will be the best treatment in your individual case. Crowns are made of different materials, but the most common materials used are either metal, such as gold, nickel or chrome, or porcelain fused to metal. Metal options are very hard wearing and less restructuring of the tooth is needed, but the crown will be visible to the eye; this option is usually better for the back teeth.Porcelain fused to metal is more aesthetically pleasing but is less hard wearing than metal, and more restructuring of the tooth may be needed. There are also less expensive resin crowns, but these are more easily chipped. The procedure will usually take place over two dental visits. After the dentist has assessed your suitability for a crown, he or she will take x-rays in order to view the extent of any decay within the tooth. If the decay is severe then a root canal treatment may be performed prior to the crown placement. 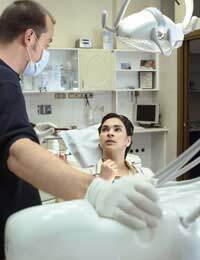 Anaesthetic will be applied to make sure there is no discomfort during the procedure; the tooth will then be filed down to an appropriate size in order to make room for the crown. However, if the tooth has decayed considerably, then building up of the tooth may be required prior to fitting the crown. An impression of the tooth and the gum will then be made in order to ensure the correct size of the crown. This impression will be sent to a dental laboratory where the crown will be constructed. While the crown is being constructed, you will be fitted with a temporary crown to cover your treated tooth. On your second visit the dentist will fit the crown and make any necessary adjustments. If you have chosen a porcelain crown the dentist will also recheck to make sure the colour matches your adjacent teeth. If the size and shade of the crown are correct then the crown will be sealed to the tooth using a cement paste. Crowns are very hard wearing and can be treated just like normal teeth. Although crowns are protective, you must still stick to regular at home dental care in order to avoid decay and gum infection. Crowns have a long life span, usually around 5 to 15 years, but over time they may crack, chip or become loose. If this does occur then consult your dentist as any gaps in the crown will allow bacteria to attack the tooth. Crowns are an excellent way of restoring and protecting teeth, and they can also give unsightly teeth a more aesthetically pleasing look. The procedure is a rapid and painless treatment that can once again give you a smile to be proud off.